Since engaging Architecture & Access to manage the design and construction of extensive home modifications, John is delighted with the outcome. 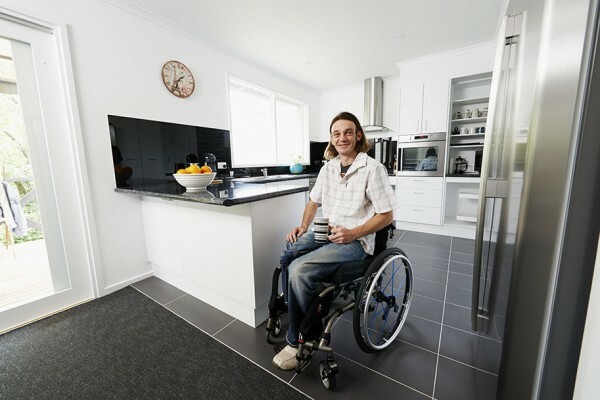 When an accident resulting in a leg amputation caused John to lose freedom of movement within the family home, he was worried he might have to move. John believes that Architecture & Access provided great solutions – enabling him to remain in the home by meeting the architectural challenges, and assisting him with design choices he was happy to live with. John’s home modification involved modifications to kitchen, bathroom, laundry, bedroom, carport, entrances, back verandah, interior doorways. Aaron also facilitated council approval, building permits, engineering consulting, and the appointment and supervision of builders. John chose a large format grey floor tile with an R10 slip rating for the kitchen, laundry and bathroom, and a low-pile dark grey carpet for the living area and bedroom. John’s new kitchen features accessible bench space with rear set plumbing to accommodate access to the sink area. The style of the tap ware and cupboard handle makes the kitchen easy to operate. The pullout pantry, full extension drawers and carousels provide ample accessible storage. Appliances include a side-opening wall oven and induction cooktop. In the laundry, a pedestal sets the front-loading washing machine and dryer at the perfect height. Aaron worked closely with John’s occupational therapist, who provided measurements and specifications for details such as bench height and depth. The new bathroom allows John complete independence in personal care, with the widened doorway, stepless shower, custom heights for grab rails, inverted T-bars and toilet, and long shower hose for maneuverability. Stepless thresholds provide seamless access throughout the house, and large sliding doors to the exterior bring light into rooms and create views to the garden. See more pictures of John’s home modification in the Project Gallery. Find out more about Architecture & Access home modification service.